It's getting mighty chilly up here around the 40th Parallel of the earth's Northern Hemisphere, leading some (okay, me) to turn our crafting imaginations to scarves and visions in bulky-weight yarn. This Burberry-inspired cowl is warm enough to wear under a blazer or a jacket on a brisk autumn evening, and — layered over a scarf — it kept my neck and ears warm last night during Occupy Wall Street's very cold Brooklyn bridge march. Best of all, the pattern is available for free online, and it only takes a few hours to make. Here's how. This is what I used to make one cowl: 1) My favorite knitting reference book, Donna Kooler's Encyclopedia of Knitting. This is the book I learned to knit with. There are two semi-unusual techniques in the Burberry-inspired cowl pattern — the temporary cast-on, and the final joining or "kitchener" stitch. I used the Encyclopedia of Knitting to refresh my memory of both. 2) Enough bulky weight yarn to complete your pattern (I used three 50g balls of Rossetti Merino/Silk/Polyamide blend that I got from Yarnology in Winona, Minnesota). 3) Size 10 needles (they don't have to be circular needles). 4) A cable needle. You will also need a blunt-pointed tapestry needle, straight pins, and an iron, not pictured. Click any photo to enlarge. The pattern I followed is not my own: it was written by the excellent Julianne Smith, who once fell in love with a $750 Burberry cowl she saw in the pages of InStyle, couldn't find any such item for sale at any Burberry store or stockist, and thus decided to make a cowl of her own inspired by the designer original. (Kind of like I did with that Prada purse.) Smith makes the pattern available for free at her website, but asks that it not be reproduced, so I am not reproducing it here. You should read it on Smith's blog. 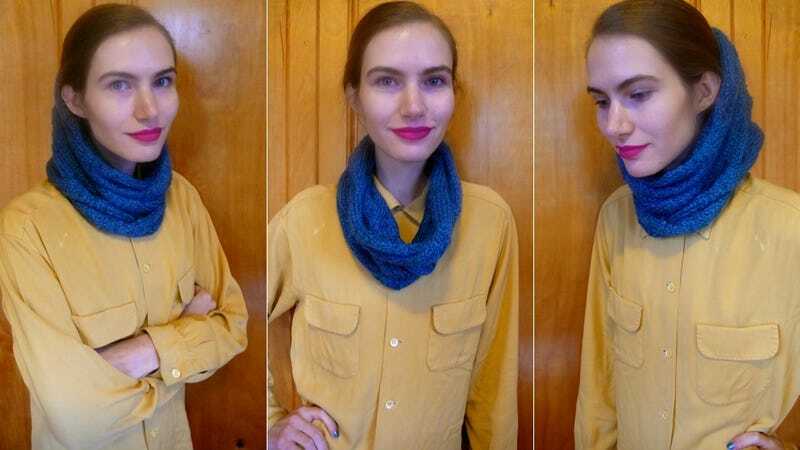 This DIY does, however, go into slightly more instructional detail than Smith does when it comes to a couple of the pattern's key elements: the use of a temporary cast-on, the cables, and the final kitchener stitch. All of these things are easy to master. The pattern itself is great: it's a straightforward 58-stitch width, with 30-row repeats, and staggered cables. Four repeats are sufficient to make a cowl. Smith kindly makes this pattern available free for non-commercial purposes, so please don't be that jerk who whips up a bunch of Burberry-inspired cowls to sell on Etsy, okay? Holding the contrasting piece of yarn taught down the length of your needle, wrap the working yarn over the needle, around the contrasting yarn, and back up and over the needle again. Each loop of the working yarn over the needle counts as one cast-on stitch. Start working your pattern. Cabling is easy! When you get to a cable, here's what to do if you haven't cabled before: 1) First, slip however many stitches your pattern calls for — in this case, eight — off your source needle, and onto the cable needle. 2) Turn the cable needle so that the stitches are resting in the bend — if you think of the cable needle as the legs of a little person, then that bend is the crotch — and either let the cable needle dangle to the front of your work (the right side) or pass it to the back (wrong side), depending on your pattern. (One creates a left-leaning cable, the other creates a right-leaning cable. Most knitting patterns with cables stagger the pass-to-the-front cables and the pass-to-the-back cables so that a pleasing overall order emerges.) Then, knit the next stitches off the source needle (in this case, eight). 3) Then, slip the stitches out of the bend and down onto the other "leg" of the cable needle, and knit them as though the cable needle were your source needle. Finish the row, and continue knitting. Your cable will look like the photo in 4) when you've done a couple more rows. See how those stitches cross over each other and create a sort of a twist? That's your cable. Continue working Julianne Smith's pattern until your cowl reaches your desired length. You want to be able to slip it over your head easily. (If you wanted to, you could double or triple the length, and make a möbius strip infinity scarf. That would be pretty cool.) When you're done, block your work while it's still on the needles. Pin the unfinished cowl to an ironing board; lightly tug at the cables, not to the point that they flatten, but just so they open up a little. Then put your iron on its hottest, steamiest setting, and just steam the heck out of your knitting — without letting the sole plate of the iron touch your project. Allow your knitting to dry completely before removing the pins. Next comes the kitchener stitch, our combination join and cast-off. The great advantage of this stitch is that it creates a join that has no visible seam. Once you're finished, you won't be able to find where your cowl began or ended. To do it, you essentially thread a needle and use it to graft your last knitted row to your first. To begin, take your working yarn, measure out about three times the width of your cowl, and break the yarn at that point. Thread your blunt-tipped needle, and arrange the two edges of your work — the last row you knitted and the first — so that they almost meet. Poke the tip of your tapestry needle through two of the stitch loops from your cast-on row; ease those stitches off the contrasting yarn that had been holding them in place, and pull the tapestry needle through. Then, returning to the last row, ease two stitches off your source needle, and pull the needle through those. Take the tapestry needle back over to the cast-on row, and poke the tip through the loop of the second of the two stitches you first sewed — and through the next loop that comes off the contrasting yarn. Return to the last row, put the tapestry needle through the second loop from the last stitch and the next loop off the source needle. Continue in this way, slowly easing loops off the source needle and off the contrasting yarn, and joining these loops to each other with the tapestry needle and yarn, until you reach the other side. Then break your yarn, and work in the ends, either with a crochet hook or the same tapestry needle. This is the final product. Pretty snazzy, right? I know the color in these photos is weirdly inconsistent, ranging from Muppet-bright to dank grey-blue; in real life it's a nice, deep, blue somewhere in between. This is a fine project for a beginning-to-intermediate knitter: it lets you practice cabling, and mastering the kitchener stitch is fun. I can see several of my friends getting these for the holidays. Happy knitting!